New Delhi, Nov 16 (IANS) Union Home Minister Rajanth Singh on Friday took stock of the situation in Tamil Nadu where severe cyclonic storm Gaja has battered coastal areas leaving 11 dead so far, and assured Chief Minister E.K. Palaniswami of all possible Central assistance. The Minister spoke with Palaniswami on phone and offered help. "Spoke to CM E.K. Palaniswami regarding the situation in the cyclone-affected areas of Tamil Nadu. Assured all possible assistance from the Centre in mitigating the situation arising due to cyclone," he tweeted. 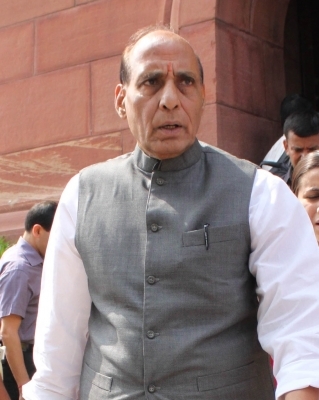 Rajnath Singh also asked the Home Secretary to monitor the situation and provide all help to the state administration. The state authorities said the cyclone crossed the coast between Nagapattinam and Vedaranyam districts between 12.30 and 2.30 a.m. on Friday with wind speeds of about 110-120 kmph. Meanwhile, the state government announced Rs 10 lakh for each family of the dead, Rs 100,000 to those who suffered severe injuries and Rs 25,000 for those with minor injuries in the cyclone which has hit road traffic in Nagapattinam area due to fallen trees and damaged power poles.